We have spent the summer shooting our bows and putting thousands of arrows into our foam targets in preparation for a few shots during the season – the shots that count. And while we hammer away at the target with field points wearing shorts and standing on level ground, the game changes come opening day. Don’t waste a summer of practice by not keeping the following “uh oh” moments in mind. 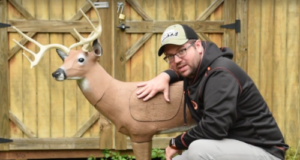 The expert Easton Archery Athletes gives advice on how to drill the vitals just like you did in practice. Fleet-footed animals like deer and antelope react to any foreign noise with a flight response. So as you released, the deer contracted their muscles like a spring ready to bolt and crouched down so your arrow hit higher than where you were aiming. If you have a 3D target, work on making this shot. On a broadside whitetail deer, you want to hit four inches above first joint below the shoulder. This will put your arrow in the pocket of where the upper leg bone meets the shoulder. You heard a twig break and suddenly there was a buck right below you. 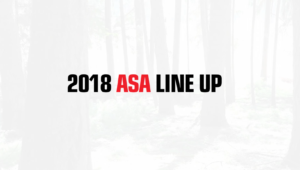 Instinctively, you drew back and searched for the vitals through your peep sight only to realize there’s a branch in the way of your arrow’s path. You held your bow for 10 seconds waiting for the deer to take one step. As you waited, you started looking more at the huge antlers. 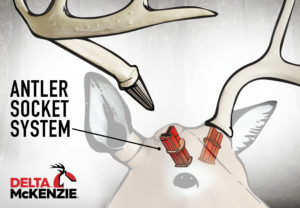 The tremors started from either fatigue or buck fever, and as soon as the buck moved into a clear shooting lane, you punched the trigger just to get some relief and missed your mark. The Solution: Besides shivering in extremely cold weather, the two main reasons we shake while at full-draw are fatigue and buck fever. We look to George Tekmitchov, Easton engineer and USA World Team Competitor, for advice on stopping the tremors. Let’s deal with the physical fatigue first. Be sure you are shooting a comfortable draw weight. If your muscles are working too hard to keep your bow drawn and anchored, the arm gripping the bow will exhaust faster. Also, shooting a bow with less mass weight will help. Finally, consider a stabilizer. “Light, stiff stabilizers with the proper weight and vibration absorbing characteristics can help absorb those small muscle tremors before they can interfere with your feel,” said Tekmitchov. Bowhunters need a strategy to suppress the adrenaline rush until after the shot. When there is a live animal in front of us and we are about to take its life, we should feel some sort of pressure. That is what the addiction of bowhunting is all about, because as we suppress the nervous energy, it comes on even stronger once a perfect shot is made. On your way to hunting camp, you stop at the archery shop to get a new pack of broadheads. Opening morning, you are in your stand and just like that, a deer strolls by at 30 yards. After all the time you spent at the range with field-tipped arrows, this shot is a gimme. You draw back, release the arrow and hear the crack of bone meeting broadhead. The Solution: No matter how well your bow is tuned, you always want to sight in with broadheads. You drew back your bow and then dropped your bow arm to get settled on the sight. This increased your draw length and caused you to pull farther than normal and your shot went high. Or you pulled the bowstring too far to one side or the other, causing a side-to-side miss. Or the angle between your line-of-sight and actual arrow flight was reduced, causing you to miss low. Either way, your arrow was off the target because you dropped the bow arm. The Solution: Bowhunters need to maintain the same upper-body shooting form in the tree stand as they do at the range. 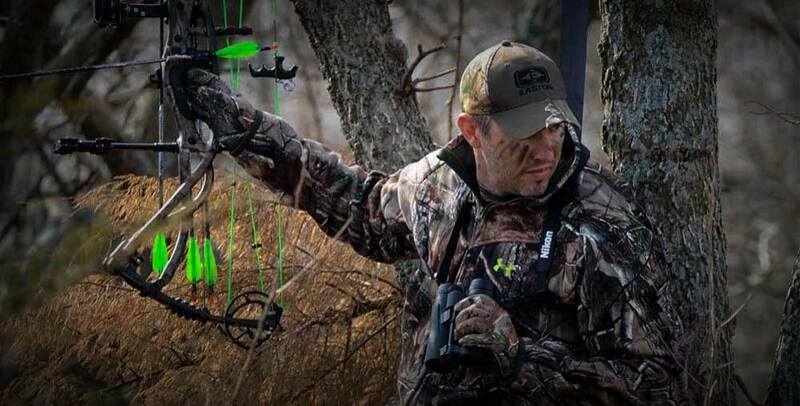 ““When we shoot from a tree stand, people forget to bend at the waist,” said Travis “T-bone” Turner. “But that changes the geometry of their form and causes missed shots. You need to compensate for the angle, but do it with by bending your waist and not by dropping your arm. For safety reasons, a tree stand harness should always be used, but it does make you more stable when leaning into your target as well. Just be sure there is enough slack in the line to bend at a downward angle. It’s a brisk fall day with 20 mph winds. You are rocking and rolling in the tree stand when a buck walks by. You get a shot off, but it misses. How could you have missed? You practiced at the indoor range all summer. The stiff crosswind muffles your expletives. The Solution: A crosswind will move an arrow off target. There are things you can do to lessen it from happening, though. You can build a wind-resistant arrow if you know you are hunting in a region that is known for its gusty winds. Or you can follow these tips on shooting in the wind from Randy Ulmer. Sometimes, though, all you can do is not shoot.